Apple has reportedly submitted a patent application for several redesigned battery configurations, which could lead to a thinner iPhone 5 or iPad 3. 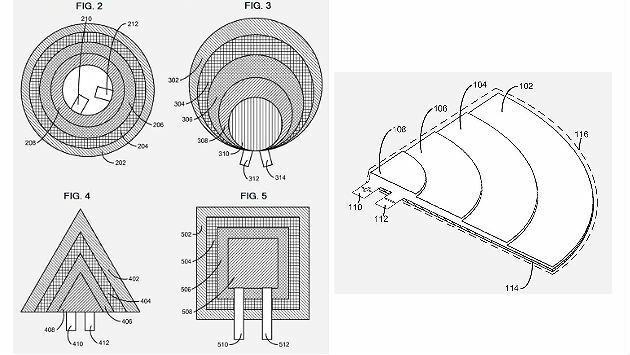 The news comes via Patently Apple, who says the new patent describes a battery cell composed of differently sized and shaped electrode sheets. Such a battery setup could be arranged in multiple configurations, allowing Apple to conserve space and build thinner devices. Current battery technology is restricted to the rectangular configuration found in essentially every smartphone on the market. The patent means Apple can get creative with its battery layouts. Triangular and circular configurations may even make an appearance within the next iPhone or iPad.